Cast Bronze Cleat; Distance between bolt centers: 23/4", Two 1/4"-20NC brass mounting screws included. 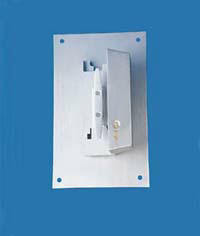 Length 9"
Cast Nylon Cleat; Distance between bolt centers: 11/8", Two #10-11/2"self tapping mounting screws included. Heavy Duty Cast Aluminum Cleat; Distance between bolt centers: 4 7/8"", Two 3/8"-16NC stainless steel slotted flat head screws included. length 14.75"
#CLC 4.5" $4.25 Distance between bolt centers 3/4"
#CLV 6" $4.50 Distance between bolt centers 1"
#CL6 6" $15.50 in silver; add $3 for bronze, white or black. Distance between bolt centers: 2"
#CL9 9" $17.50 in silver; add $3 for bronze, white or black. Distance between bolt centers: 23/4"
This unit comes complete with a cleat cover box mounted onto a 20” high, 12” wide, 1/8” thick aluminum plate. Designed to be mounted using thru wall bolts or expansion shields (not provided) utilizing 3/8” diameter threaded rod. Standard colors are: Silver with satin finish, Clear anodized, Bronze #313, White & Black. Please specify color when ordering. Comes with lock and keys.